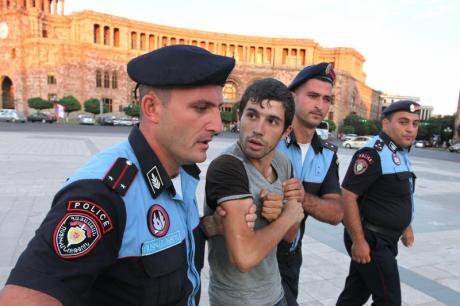 Protester against electricity price increases,Yerevan, July 2015. Demotix/Photolure News Agency. All rights reserved. Davit Stepanyan: Ingar, you were recently in Armenia and you are aware that on December 6, a referendum for changes in the current Constitution is scheduled. At the local level it is noteworthy that, under the pretext of moving from a semi-presidential to a parliamentary system, the RPA (Republican Party of Armenia) and the person occupying the president’s post (who, under the current constitution, cannot run for president for a third time) are trying to establish a particracy similar to that in the USSR during the Brezhnev era. The difference is that the model bears a greater similarity to some of the eastern bloc states - notably Poland and the German Democratic Republic - which had one ruling party and a few small parties that were its allies. A number of other changes are also taking place. The proposed constitution does not stipulate that the state will take the necessary measures to realise its citizens’ rights to housing, or to provide social security for the elderly, the unemployed, those with disabilities, or those who suffer the death of a breadwinner. Furthermore, while these are irrevocable rights under the current constitution, I note that a citizen’s right to a fair wage no less than the minimum wage, and alongside the right to free healthcare, will henceforth be regulated by law. The proposed draft does not include current constitutional provisions stipulating that the realisation of a property right must not cause damage to the environment or violate other people’s rights and lawful interests, those of the public or the state. Nor does it include provisions on the human right to live in a healthy and favourable environment. Moreover, state officials will be exonerated from liability for hiding or refusing to disclose information on the environment. Taking into consideration the large volume of mining in Armenia, it is easy to imagine the consequences of these changes in the near future. To sum up, put it this way - less state, more market, with the depoliticization of economic decisions. Ingar Solty: Let’s start with the transformation of the political system in Armenia into what you describe as a new Brezhnevian “particracy” which you have likened to real-socialist Poland and the GDR. The system in the GDR and in Poland was considered to be post-capitalist. Multiple parties were no longer needed because of the alleged lack of capitalism’s class antagonism between capital and labour, which is something that ought to be kept in mind when discussing those similarities. When I reached Armenia in mid-September, the discussion was about a new constitution which would involve a new electoral system – namely the shift from the current semi-presidential system, with elections part proportional representation/part first-past-the-post, to a parliamentary republic with a full proportional representation system. Given that, the changes suggested by the ruling conservative RPA, i.e. from above, were presented in terms of similarities to the 1949 German (Basic) Constitution. Back then, I said that in my view we should always be sceptical with regard to “reforms” from above, and question the political motivations behind them. From historical experience we know that democratization has never just been granted from above, from the powers-that-be. Instead democratization has essentially always been the result of struggles from below which lead either to a new leadership or to processes of defensive democratization. By this, I mean a process in which the forces from below are co-opted and absorbed by the ruling historic bloc and some of their demands, which are compatible with the existing power structure, are met. Now, from what I have understood about the situation in Armenia, the decision to change the Armenian constitution was one that was initiated from above via the technocratic elites of the Specialised Commission on Constitutional Reforms, exclusively controlled by President Serzh Sargsyan and the RPA establishment. As a result, my advice as a hesitant outsider was that one might want to consider demanding and initiating a real democratic and participatory constitutionalization process, a constituent process from below, which could be based on the formulation of common social and political demands that could then pave the way for a democratization of Armenian society, according to the above definition. As you know, we have seen similar constitutionalization-from-below processes with the “re-founding Europe” movement in response to the EU’s “Silent Revolution” from above (Jose Barroso). I then argued that given the case that such a process could not be initiated in the short period leading up to the constitutional referendum on 6 December, 2015, one might as well prepare labour and other social movements, as well as their allied alternative political forces, for the situation of a fully proportional representation system, simply because, when compared to the full first-past-the-post electoral systems which exist in the United States, Canada, and the UK, or the semi-presidential system with its strong first-past-the-post element in Armenia, these electoral systems generally tend to be much more representative and also much more responsive to democratic pressures from below. In countries with such electoral systems the new left-wing surge is currently not taking the shape of new and old left-wing parties such as Syriza in Greece, Podemos in Spain, and others, but rather the shape of rank-and-file revolts and entryism strategies inside the existing ‘left’ parties. In full proportional representation systems with strong parliaments, new parties can start by forming a strong minority opposition in parliament organically linked to extra-parliamentary social movements, such as the 2013 protests against public transit fare hikes or the 2015 “No to Robbery” protests against electricity price increases in Armenia – movements which are supported by some opposition parties using the parliament as a rostrum. However, from what I now gather, the alleged electoral system “reform from above” sounds much more like a counter-revolutionary putsch from above aimed at creating a one-party state. And for me, this raises a number of questions. But, before we start discussing potential similarities and differences between the new crisis-constitutionalization of Europe and what is happening now in Armenia, could you explain the following? In early October, 104 members of the National Assembly voted in favour of putting the proposal to a referendum; only 10 MPs voted against it. And can you explain why even smaller parties, which presumably would be weakened or even eradicated by the new political system, are in favour of the new constitution? What are the driving forces behind those parties? What interests do they have in mind when it comes to supporting the referendum? And which forces and which ideologies are driving the Armenian National Congress (ANC) and the Heritage party, which are opposing the new constitution? DS: Well, the so-called proportional representation system potentially contains certain rating elements which will always allow local Republican oligarchs, often referred to as ‘feudal lords’, to be brought to power, if needed. My understanding is that the draft contains some intentional gaps, and some issues have been left ambiguous. This will allow for a management with the aim of serving the interests of RPA leaders at any given time. As for Armenia’s system of government, never has the ruling party transferred its power to the opposition. Rather, there have been processes similar to a palace coup. And since 1996 the elections have been regularly rigged. The draft of the new constitution rules out the kind of policies which enable a democratic state to guarantee economic and social rights through public employment, public investment and public welfare provisioning. As for the parties which voted against the draft, they were formed around presidential candidates who challenged the regime in the 2008 and 2013 elections and who would have most probably been elected if not for electoral fraud. It is hard to say which social classes those parties represent because they would not have existed without their leaders. But the ANC calls itself social-liberal, and representatives of the Heritage party once told me that ideologically they are most similar to the conservative Christian Democratic Union of Germany. Apropos the parties which voted for the draft, the most appropriate name for their activities is clientelism. IS: That is very interesting, and it begs the question why a political system that is only a two- or multiple party system by name, and which already functions like a one-party system, ought to be formally changed into one. So, with regard to the real-concrete changes of the content of the Armenian Constitution, let me say that when I looked at the draft of the new constitution and compared it to the old one, I came to the same conclusions that you did. Its main content does not seem to be simply a tool which would allow Sargsyan to remain in power after his second term. What appears to be crucial is that the draft of the new constitution wants to do away with the key remaining social-democratic elements of the Armenian Constitution, which limit the total power of capital. This includes Article 32 which still guarantees workers’ rights, Article 34 which guarantees housing and a certain standard of living as a social right, and Article 38 which guarantees free public healthcare as a social right. These Articles of the current constitution still envision and effectively necessitate non-market solutions when these rights are supposed to be realized. However, in my view, the anti-working class and anti-democratic content of the new constitution goes even further than that. This can be seen, first of all, in how it allows for the restriction of the right to strike. And all the other following tasks are formulated in terms of verbs such as “support” and “promote.” In other words, the state’s role in the economy is no longer supposed - yes, no longer allowed - to be proactive in terms of redistribution policies, let alone in terms of nationalizations and socializations of the commanding heights of the economy. In other words, the draft of the new constitution rules out the kind of policies which enable a democratic state to guarantee economic and social rights through public employment, public investment and public welfare provisioning. The state is now supposed to create a business-favourable environment, which, under conditions of global capitalism and capital mobility, essentially attracts globally mobile capital with national, regional and even local tax cuts and state subsidies, as well as tax labour and environmental regulations. Furthermore, under the new constitution, it seems that it would be totally legal to shift all remaining public and “free” Commons (in primary, secondary and higher education, public health-care provisioning, public pensions, social insurance etc.) into the for-profit private sector. In Article 60 of the new constitution on the ‘Right to Property’, property rights are supposed to be enhanced. So the new Armenian Constitution indeed appears to be another form of what the British-Canadian political scientist Stephen Gill famously called in 1991 the “new constitutionalism of a disciplinary neoliberalism.” And by that he meant constitutionalization policies which, in the general interest of capital constantly searching for new profitable investment outlets, lock in and prescribe market-oriented/neoliberal economic policies. Thus democratic sovereignty is limited and economic policy decision-making is effectively depoliticized – in the sense of being effectively moved outside the realm of popular influence. The new constitutionalism thus creates a situation in which parliamentary elections based on universal suffrage still take place and the illusion of popular sovereignty is upheld, while in reality parliaments have been essentially disempowered in the material issues that really matter. DS: Taking into consideration the weakness of the new leftist powers in Armenia, it is easy to notice that the criticism directed towards the government is for the main part concentrated on moral and patriotic planes. The majority of active citizens blame the government for betraying national values, being uneducated, illegitimate, and for other shortcomings. But the limitation of economic policy is not perceived as a limitation of democracy. The intactness of banking activities and charitable activities are more important than fair social policies. The intactness of banking activities and charitable activities are more important than fair social policies. In essence, by moving to such a parliamentarian system or one of collective irresponsibility, the ruling political group hopes that it will feel safer when pushing forward the political-economic agenda coming from outside and when restraining popular revolts. IS: I think you’re right. Yet, what I think we must understand is that this restriction of democracy and the sovereignty of parliament is quite intentional, because it serves powerful interests. A general problem I see is that we still tend to think that capitalism and democracy go hand in hand or that they are even identical. Only recently the global crisis and its – often authoritarian – management by the various capitalist states plus the rise of political forces from the far right have taught us that this is not necessarily the case. In the nineteenth century being a “democrat” in the core capitalist countries of what today is “the West” turned you into a bigger enemy of the state than calling yourself a “socialist” (who was just someone who didn’t think that laissez-faire capitalism and total lack of social security might be the best idea). And while liberalism was democratized in the first half of the twentieth century, the relationship between capitalism and democracy has remained contradictory and full of tensions. Liberalism has never lost its deeply anti-democratic roots and its suspicion vis-à-vis the masses and popular sovereignty. In a nutshell, the new constitutionalism means that we vote, but it doesn’t matter and it doesn’t change anything. In fact, the whole point is that it doesn’t matter and that it doesn’t change anything. In a nutshell, the whole point of the new constitutional - ism means that we vote, but that it doesn’t matter and it doesn’t change anything. Now, the emptying out of democracy and its material social-democratic contents is what the British political scientist Colin Crouch has famously termed “post-democracy”. Crouch misunderstands that historic capitalism has always been “post”- or rather undemocratic, insofar as private property was placed under the highest protection from the bourgeois state from the get-go, and insofar as the “western” Keynesian welfare state was a spatial and temporal exception in the history of capitalism, not the rule, and that it was co-determined by the existence of the Soviet Union counter-model. In any case, the Armenian situation appears to be an example of a wider general trend in global capitalism: the establishment of what German Chancellor Angela Merkel during the Eurozone crisis has notoriously demanded when she called for a “market-compliant democracy.” This is the vision of a “flat world” in which democratic decision-making processes do not harm the free flow of capital. DS: In Armenia, under conditions of full depoliticization, there is a tendency to turn decision-making into a purely administrative process; to create a sphere where specialists and technocrats will make the right decisions without political participation and will not obstruct investments being made in the country or the interests of businessmen, regardless of how those economic processes impact the welfare of the masses. In general, parties are also being depoliticized, and the differences between their viewpoints becomes insignificant and fits within the logic of the system. It is no coincidence that the RPA, which is initiating the constitutional changes, announces that the constitution can be changed only by the elite, who have to explain the necessity of those changes in a language comprehensible to the populace. 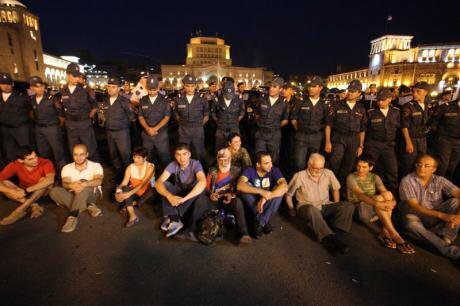 Protest against electricity price increases,Yerevan, July 2015. Demotix/Photolure News Agency. All rights reserved. The Armenian case seems to be somewhat exceptional because the Armenian government appears to want to directly restrict its own democratic accountability and responsiveness, while other states such as the EU member states do not need this kind of new constitutionalism that is taking place in Armenia, since the technocratic elites’ new economic governance in the Eurozone is overruling national constitutions in many ways. Having said that, there exist also other states besides Armenia which are currently trying to fundamentally alter their constitutions from above. For me, the interesting question is therefore what the RPA, and the alliance of social class forces which it represents, are trying to achieve by suddenly developing a new draft of the constitution? They either have to be pushed from below or consider it in their most vital interest, i.e. in the interests of the forces they represent, to actively initiate such a process. Does it have to do with the inter-imperial rivalry between the “West” and Russia and the different models of capitalism they represent? Does it have to be seen in the context of the cancellation of the EU Association Agreement and the Deep and Comprehensive Free Trade Area - the negotiations of which were completed in July 2013, but then halted in September of the same year, due to Armenia’s new negotiations concerning membership in the Customs Union of Russia, Belarus and Kazakhstan? The EU is Armenia’s biggest trading partner; is it possible that the Sargsyan government thought that it could improve its political position by playing it safe with the US, the EU and Russia at the same time, and simply did not expect the kind of imperial tug-of-war between the US/EU and Russia in the post-Soviet area which unfolded in 2013-2014 during the Ukrainian Crisis? Is the new constitution possibly an attempt by Armenian capital and oligarchs to signal to EU elites and to European capital that they are determined to fulfil transnational capital’s wildest dreams and are unlikely to resort to “state capitalism” of the Russian kind? What do you think? DS: This is not just my opinion. Everything points to the west having dictated the constitutional changes as a counterbalance to Armenia’s membership of the Eurasian Economic Union (EEU). If the draft is adopted, Armenia’s system of government is going to differ from those of the other countries in the EEU, and it is going to be harder for Russia to control it. It is no coincidence that it was after his meeting with Putin on September 3, 2013, that Sargsyan spoke about the changes for the first time. That was the meeting during which he was pushed to join the EEU. The changes are a compromise with the west, but regardless of that, Sargsyan and the RPA inserted provisions in the draft that are intended to protect their narrow group interests. The saddest part of this story is that Armenian society has not yet found a way to protect its interests and effectively participate in this process. This society, which is straining under its post-soviet burden, is caught in the middle of its past, and rapidly spreading consumerism. But there is one contradiction which attracts my attention - (as unfortunate as it may be) if the draft is adopted, the actual situation in Armenia will be formalized, and people will lose their hope for justice which, even though it was non-existent in reality, was nonetheless written down in the current constitution. And now intellectuals capable of critical thinking can only ponder upon what can be done when a nation, having lost its vision of justice, rises up.